The first headline this week is from my hometown of Atlanta, Georgia- Atlanta Pollen Count Hits All-Time High. For those who do not live in areas that have issues with tree pollens, count yourself blessed. 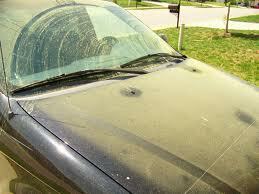 What this means is that when you go out to go to work, you have a thick yellow coat of pollen on your car. This is the same stuff that you are breathing all day. People with allergies cough, sneeze, and have red, burning eyes for a couple of months. This is the highest that the pollen count has been since 1999. Welcome South, brother! Second Place this week goes to this story, also out of Atlanta: Woman, 87, Accused of Bullying 71-Year-Old. Evidently, 87 year old Maria, and 71 year old Bernadine don't play well together. This started two years ago when Bernadine disturbed a rosebush that Maria had planted. Maria attacked Bernadine with her cane and called her some names. Maria was arrested for Battery and had to take some Anger Management Courses. Recently, Bernandine said that Maria was swinging her cane again, this time trying to hit Bernadine's dog. Bernadine says, "Since I moved here my life has been just pure hell." When Maria was asked for a comment she just said, "She is crazy." It sounds like the pollen is getting to both of them. This weeks winning headline is a sad one out of Pakistan- Nearly 1000 Pakistani Women Killed for Honor. This number for 2011 is even higher than the almost 800 women that were murdered in "honor" killings in 2010. Over 200 of the women killed in 2011 were put to death because they married without permission. Others were put to death because of "illicit relationships" or dishonoring their families in some other way. Most were murdered by family members, brothers, fathers, or husbands. Few of these cases are ever prosecuted. Pakistan has long been an uneasy ally in a region that is constantly in turmoil. The United States gives Pakistan around 1 billion dollars a year for their "help" in the war on terror. Maybe it is time we attached a few more strings to that money and put pressure on this country that still has a culture that ignores the abuse and murder of women. And why don't the liberals in America who are burning so many calories attacking Rush Limbaugh tackle this subject? Rush might not be politically correct but he has not murdered anyone. Here is the link for anyone who wants to contribute to our Brazil Missionary Endeavors!